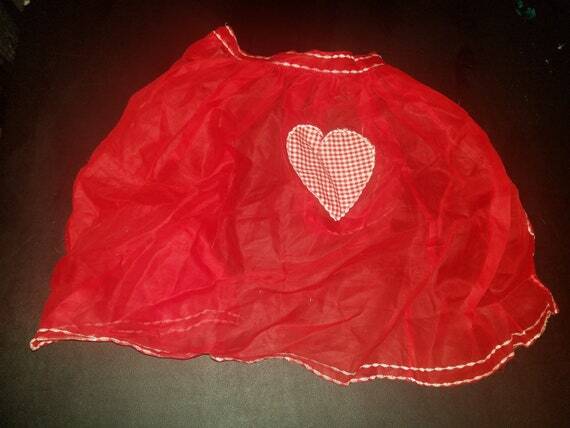 Vintage white apron with red pin dots and red aplliqued hearts. Medium, will fit up to 34 inch waist. All cotton. 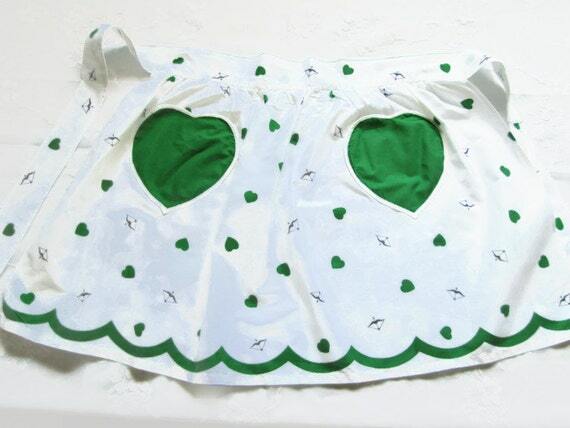 This apron would make a perfect gift for a little girl who likes to dress up and be like Mummy. The white seersucker with heart applique and rick rack braid has a retro feel. 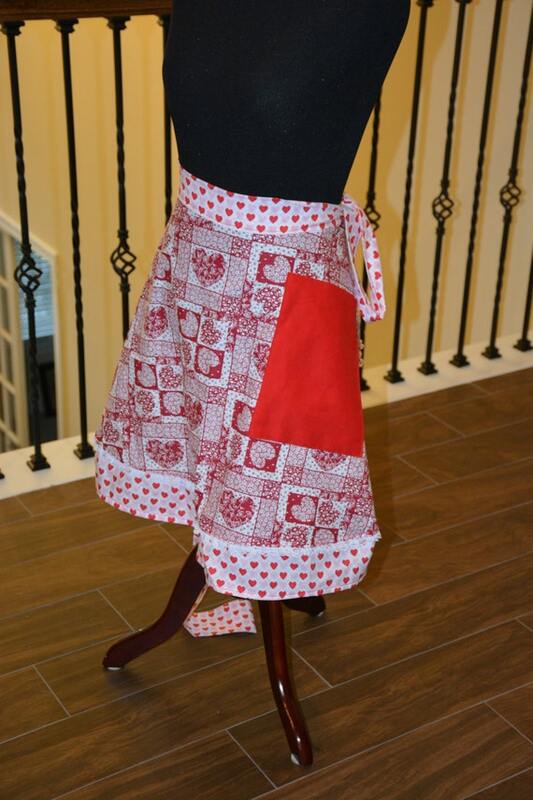 The apron has all-around ruffle and a bright red heart and all-around red rick rack braid. 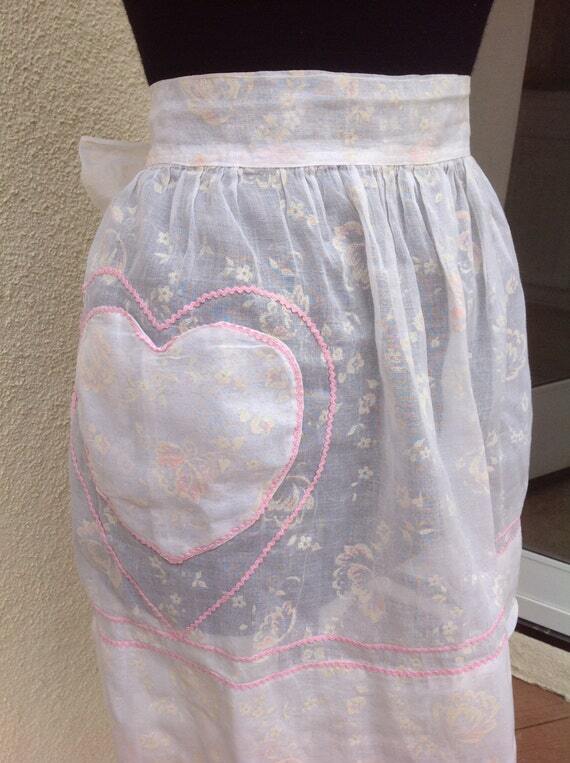 This is a feminine little apron for little girls who like pretty things. You may choose different colors for the heart and trim – just add that detail in a note. For size 2-3, length (including waistband and ruffle) is 8 1/2″, width at waist (including ruffle is 10 1/2″, total waistband/tie length is 50″. For size 4-5, length (including waist band and ruffle) is 10″, width at waist (including ruffle) is 12 1/2″, total band/tie length is 60″. 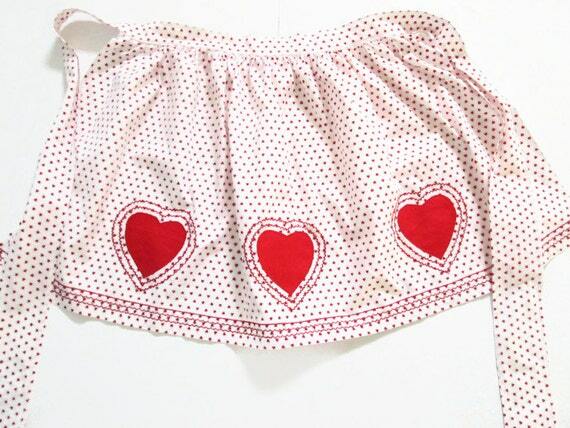 This cute 1940s or 1950s Vintage Heart Apron is made of a see-thru fabric, probably cotton, and has heart pockets outlined in red vintage print fabric. 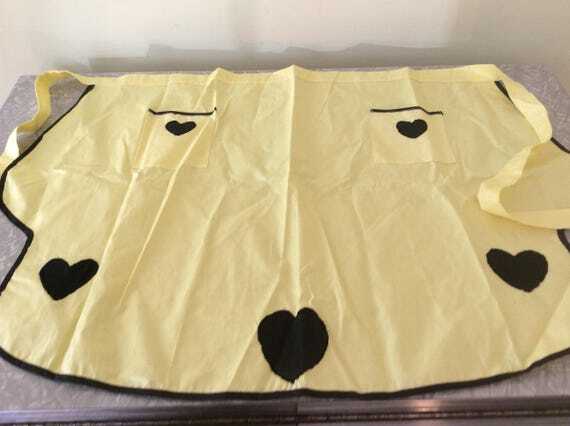 The edge of the Apron is scalloped and also outlined in the same fabric. Perfect for a hostess gift for someone you love. This sheer white apron has maroon checkered material at the top, bottom and pocket. It is in good condition, with a small tear at the end of one tie. It has a waistband at the top. I is 17 1/2″ long by 12 1/2″ wide at the bottom and 7″ wide at the top plus the ties. 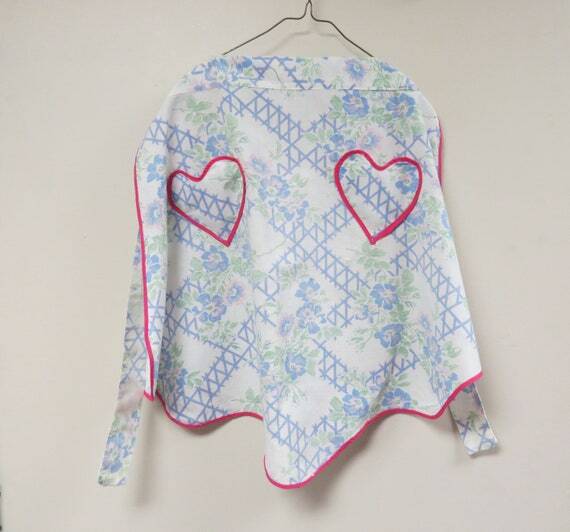 If you like hearts, organza and rick rack, this is the hostess apron for you! Just a sweetheart! Made of white, crisp organza with a brocade pattern that has a hint of pink as well. 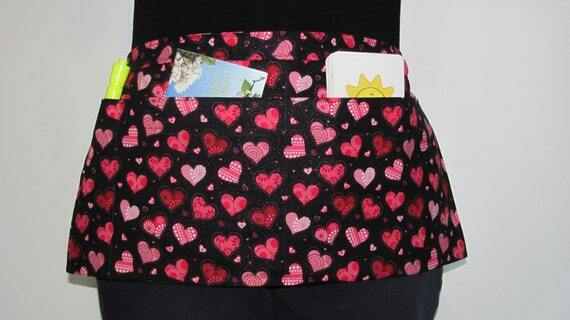 Apron has two heart shaped pockets on each hip trimmed in pink baby rick rack! Hem and sides of apron have the same pink trim. Measures 18″ from the top of the waistband to the hem bottom, 35″ across at the hem, 21″ at the waistband. Ties are both 25.5″ long. My Heart Is The Worst Kind Of Weapon half apron was handmade by me, Nicoleslaw! It has matching, yet contrasting fabrics. The main fabric is red with white hearts and the ties, waistband, pocket, and pleat feature white fabric with red hearts. This is perfect for your special valentine! One size fits most, please let me know if you have any questions about this item. The Young Hearts Run Free half apron was handmade DELETE THIS by me, Nicoleslaw! It has contrasting, yet matching fabric. 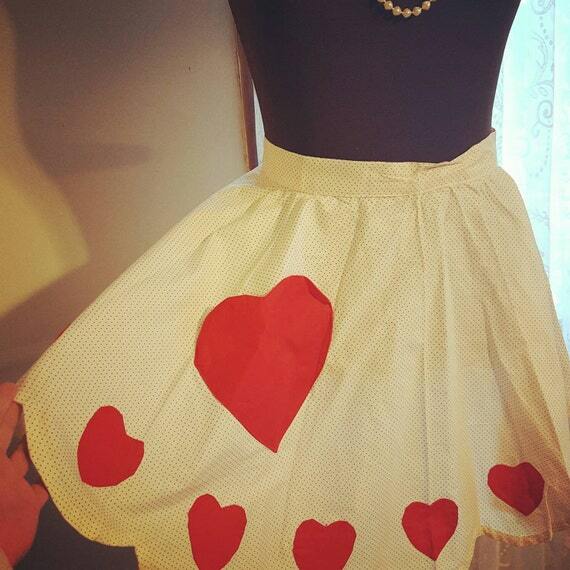 The main fabric is white with red hearts, and the waistband, pocket, and pleating is red with white hearts. Perfect for your favorite valentine! One size fits most. Hand crafted of durable 9oz duck cloth and 100% cotton. Reinforced stress points, machine washable and extra long 42″ x 1/2″ ties. Size 22 1/2″ W x 12″ L with 9″ depth pockets. 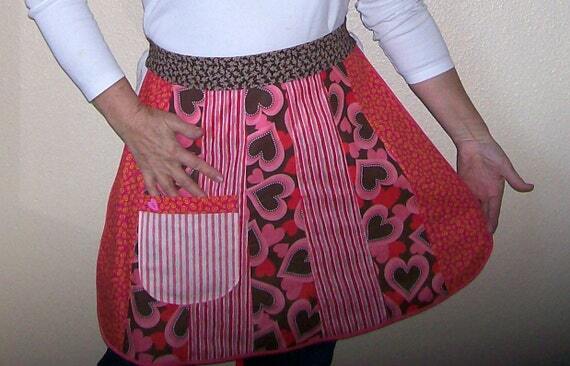 Dark Brown / Light Brown Heart Fabric Apron with one front pocket. Ready to ship. Handmade and designed by me. 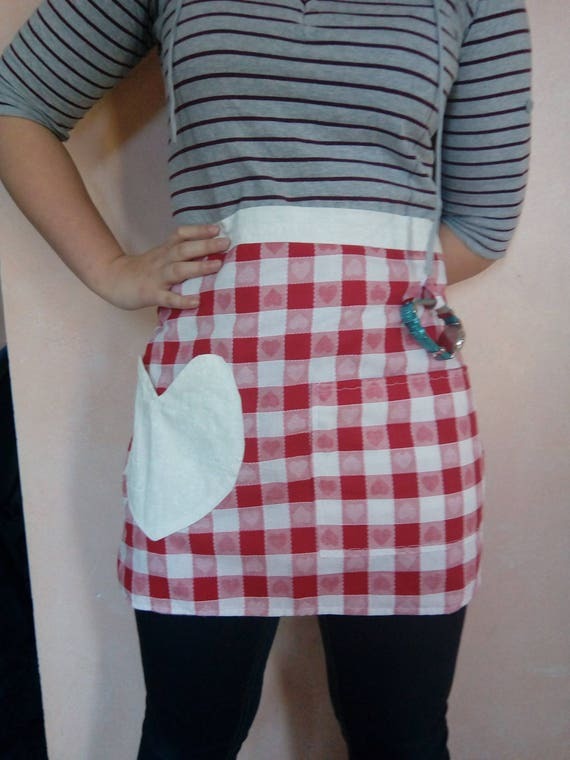 ♥ Women half apron is brown, beige, off-white, light/dark brown and crème colors. The chic shabby style will bring out personality and unique of you. ♥ The pocket is perfect for holding all sorts of useful objects. Great gifts for that someone special. 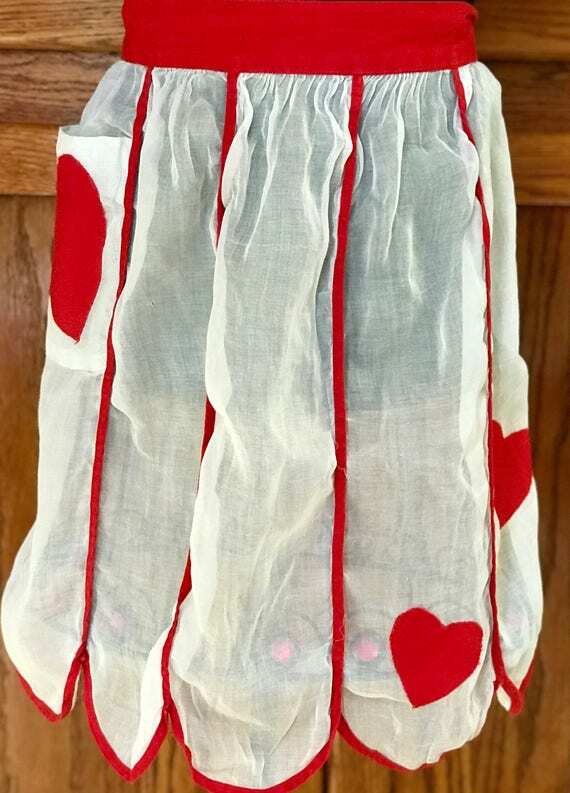 ♥ The heart apron is not only for everyday cooking but also for occasions (Bridal showers, Mother’s Day and garden parties, or picnic, etc). 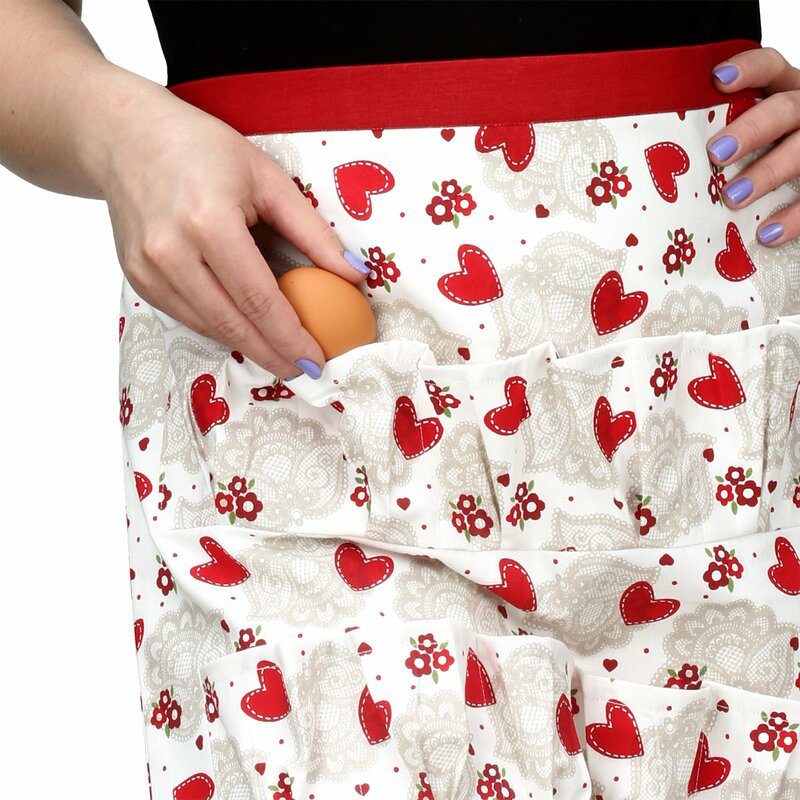 ONE SIZE – Adult women – The size of the apron is adjustable with waist ties. These aprons are perfect for the classroom, art/craft show booth, food booth, tool room/shed or any use around the home or workplace. They are made of all 100% cotton fabrics and feature 8 pockets, including one pocket with a zipper closure and a swivel key holder. 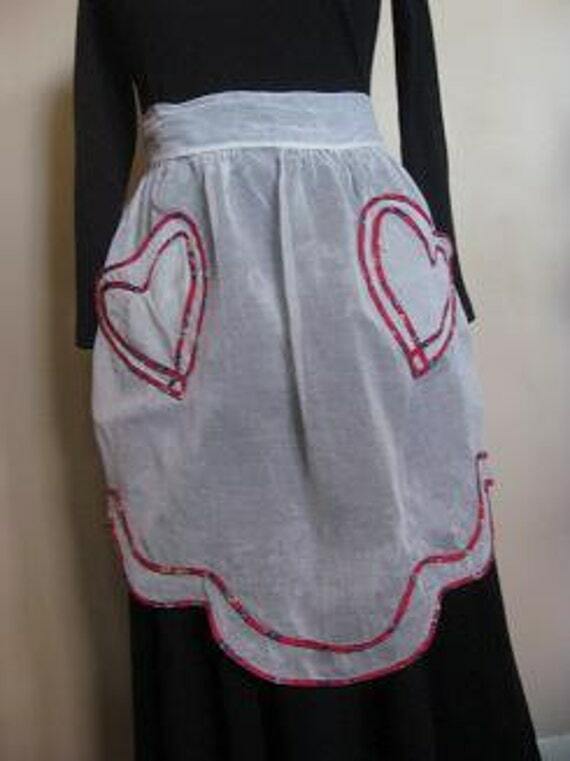 Bottom of apron is embellished with four red heart handkerchiefs. Embellished with silver and white bric a brac trim. 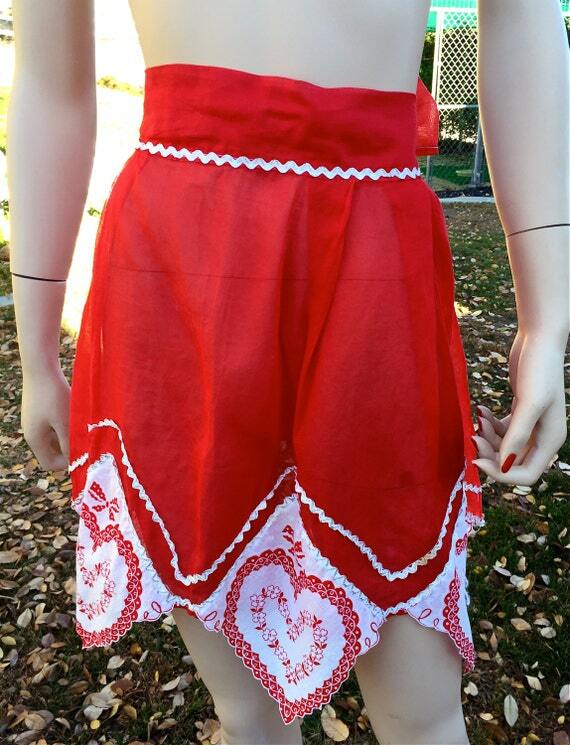 This red vintage sale apron is so pretty. 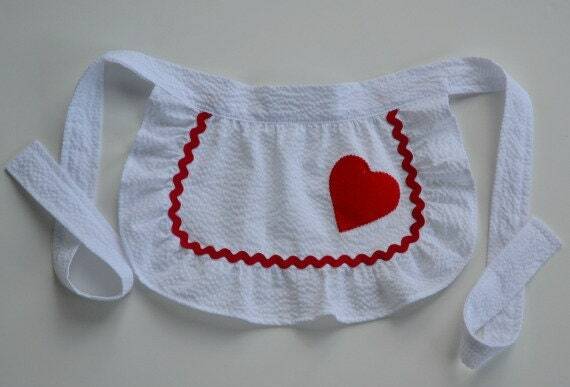 The apron is white sheer with red details. Red ties, red hearts, and red trimming the apron. One pocket. Zoom in. Very pretty apron. Great condition. My pics do not do it justice. 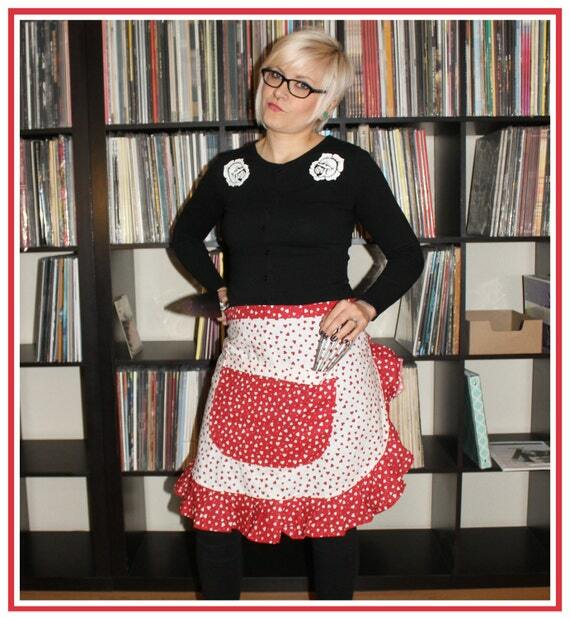 I did not make this retro apron. It is a RELOVED apron. I am passing this on to you, enjoy this sweet apron. Hearts, stripes and curlicues – all in shades of shrimp pink, red and cocoa! 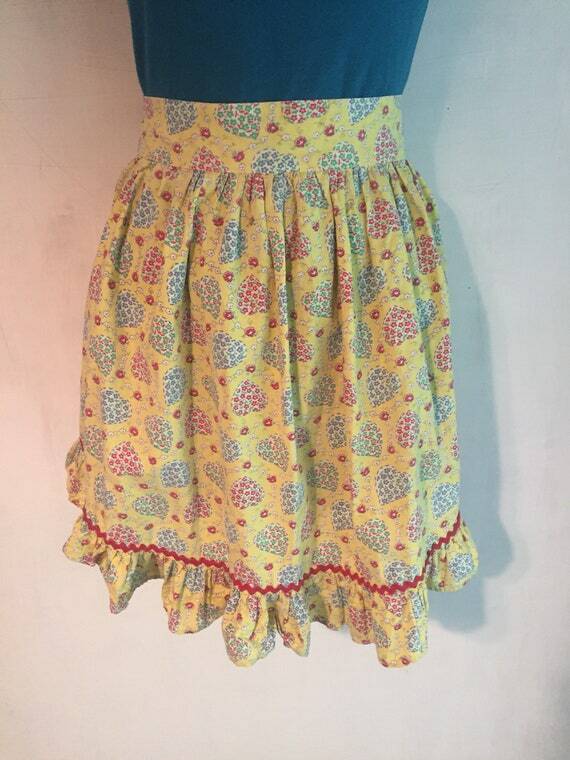 This fun ‘petal’ style half apron is very retro! Just like the thrifty housewives of the past, I LOVE using my fabrics to the last little scrap and one of the ways I do this if I have only a narrow strip left is to make a ‘petal’. Once I have a stack of petals, I start playing with them to see what looks good together. I think they’re adorable – AND they’re fun to put together – best of both worlds. My #1308. One Size. This particular combination is subtle and beautiful. There’s also a small pink heart in the corner of the pocket for added detail. All of the seams joining the pieces are French seams and the edges are all bound in seam binding, so there are no raw edges to these aprons – they should last a long time! Waist band is 19″ wide and 2″ deep. Ties are about 42″ each. Length is 19″, including the waist band. A really cute and fun way to serve your customers! In a hand made,three pocket apron. Deep pockets to hold your money, pens, pads, and straws. 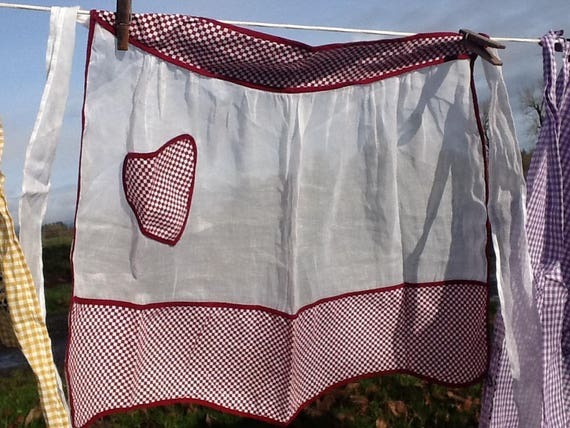 All new fabric, very durable machine wash, hang dry. 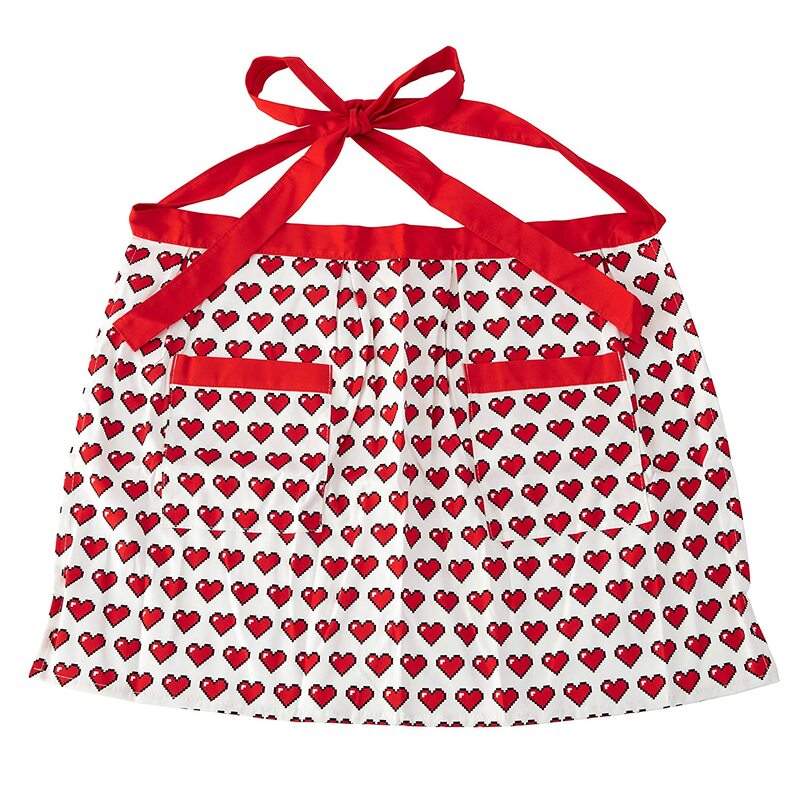 You’ll fall in love with this adorable heart apron! 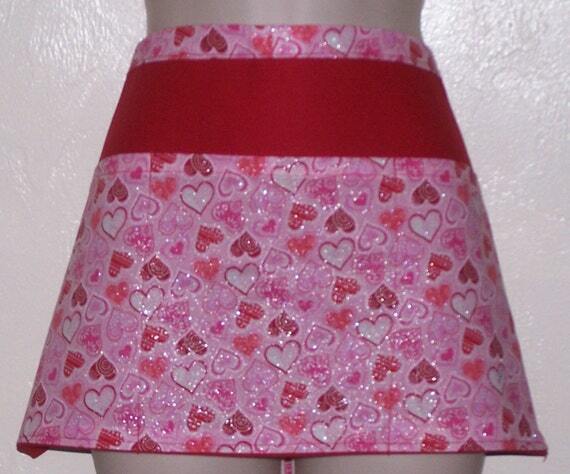 Perfect to wear around Valentine’s Day or all year long. 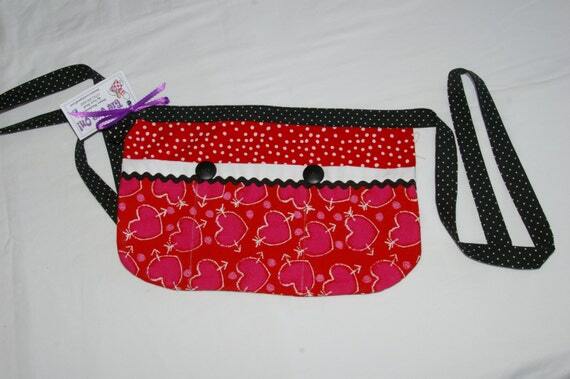 Red and pink hearts against a red polka dot background, accented by a white band, black rickrack, black buttons and black dotted ties – it all makes one great little utility apron! 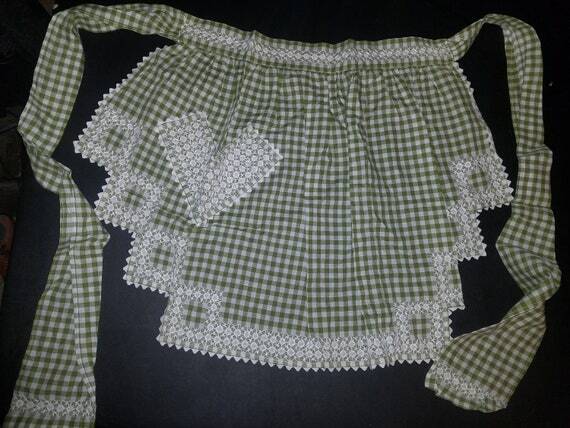 This apron is a Medium to Large in the child range and could be worn by an older child or a teen – it measures 14″ wide x 9″ long and ties/waist = 77″. The apron has 3 pockets (3.75″, 5.25″ and 5″) , plus a tool loop. My #1298. Teens and pre-teens get very difficult to buy gifts for, but this could work – if they’re a crafter of any kind, it’s the perfect place for scissors, pencils and the like. Of course, there’s a pocket for a cell phone (that’s a must). If they like to groom the pets, they can carry the brushes and clippers. Or, simply fill the pockets with candy kisses to show your love. 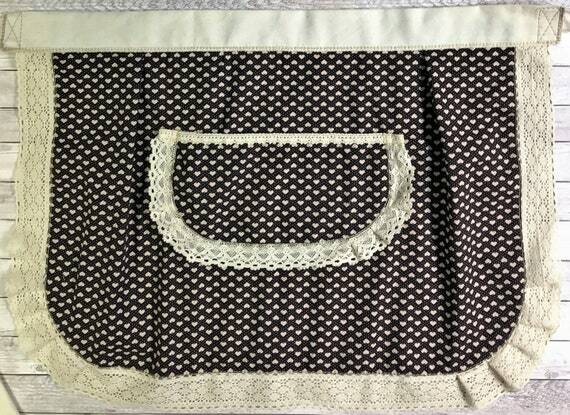 Vintage, cotton, feed sack material apron with a lovely floral pattern. Hand crafted with heart pockets and red bias tape trim. There are some holes and some of the bias tape trim is uneven. Ties measure 18 1/2″ long, waist measures 18 3/4″, and it is 21″ long. 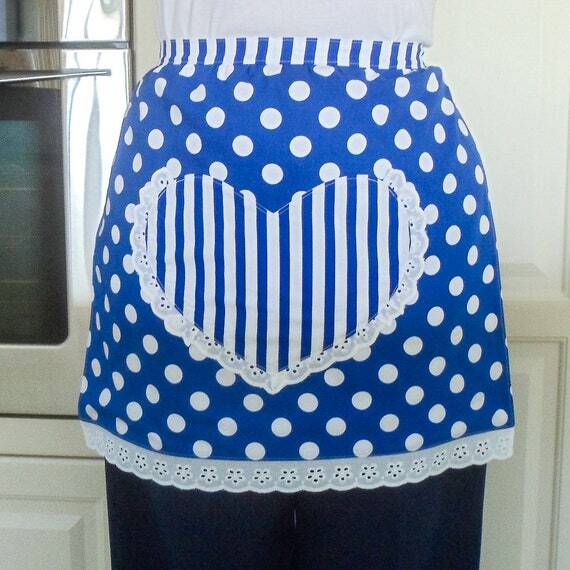 Polka Dots Apron, Half apron blue white, womens retro 50s apron with striped heart pocket, kitchen tea hen party apron, cafe waitress apron. Love all things Retro? Why not bring a “retro rockabilly” look into your kitchen with these jazzy “Blue and White” aprons! They come in a fun “Spots and Stripes” print pattern style and I have added a subtle splash of Broderie Anglaise lace to complement the design. Made from quality, fully washable, colorfast, light weight 100% cotton fabric and lined in white polyester/cotton. The fabric is pre-washed and seams are top stitched for durability. Large handy lined front pocket which is practical for all your kitchen utensils and other essentials. One size fits all. Gathered at the waist for comfort and tied at the back with extra long ties. So sweet, this cheery yellow apron would make you want to do the dishes! Adorned with little flowered hearts and trimmed in red “ric rac”, just screams country kitchen! Measures 19” long with a 17” waistband and 25” ties on each side. Good condition, no tears or stains! Charming! Cook up some fun in your kitchen with super skills. Cute apron with your favorite characters is made for you in the kitchen. There is the accent of a pocket to put in a recipe card. This is a cute and amazing way to show off a fun-loving style. Want a set or a custom order? I find great joy in bringing fun items to my customers. I am always looking for feedback on what you may think is a great item of interest or even something new that you may be interested in. If you want something that speaks to you your request is always welcomed. Please feel free to send me ideas that appeal to yours or a friend’s geeky taste. Just send me a message or start a custom order request. I am happy to do custom requests if the fabric is not out of print. In general, I can turn a custom request around within a week. Holiday time frames may require bit more time but we can work through the details. 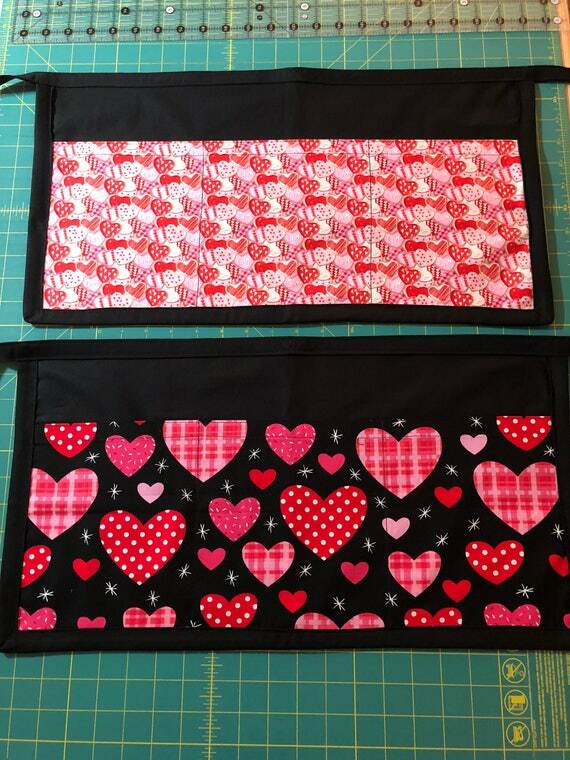 All these aprons have the same red & white checkered print on one side with hearts in the alternating squares. The 8″ 20cm heart-shaped pocket, the rectangular pocket and waist tie are an off-white tonal floral print. 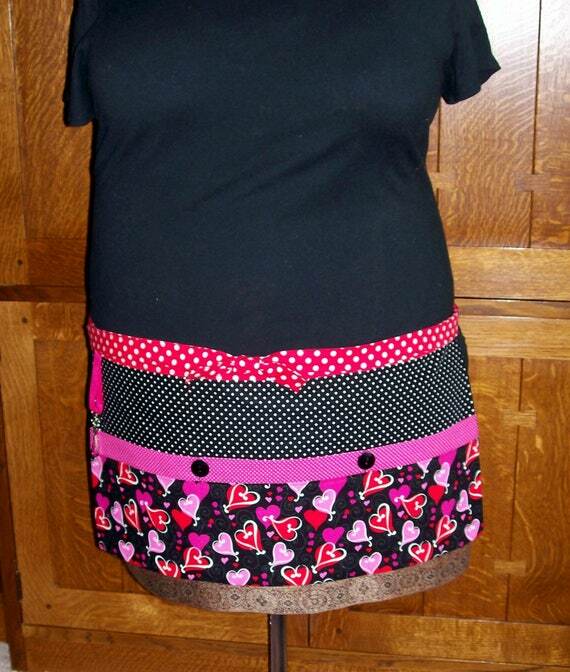 Valentine’s Day Half Apron. The apron was hand made. The material is a lightweight cotton. The apron was machine embroidered with appliqué work. The half apron measure 16 1/2 inches long not including the 1 1/2 inch waistband and approximately 35 inches wide (measured at the bottom). The waist band tie measures 75 inches long (end to end). My aunt made this half apron in the 1960s / 1970s. It was given to my mom when my aunt and uncle were transferred to Geneva Switzerland in 1979 for work. 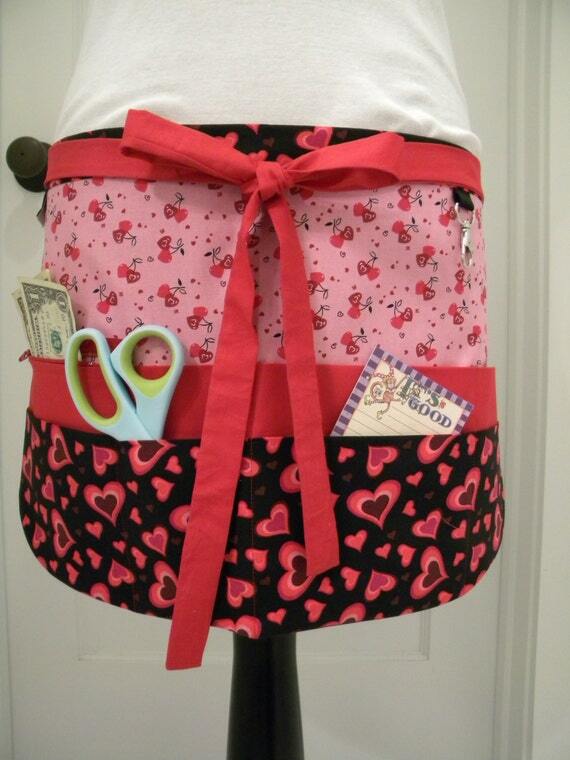 Valentine’s Day Half Apron. The apron was hand made. The material is a lightweight cotton. There are two heart pockets. The half apron measure 17 inches long not including the 2 1/4 inch waistband and approximately 33 inches wide (measured at the bottom). The waist band tie measures 65 3/4 inches long (end to end).